The straight forward short par 4 1st hole at Tates Creek is exactly the sort of marshmallow warm up hole that you’d hope for to start a round. 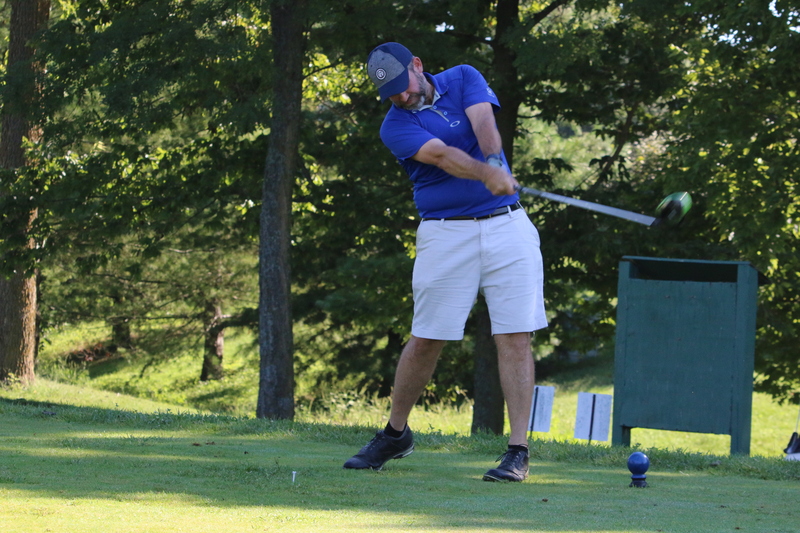 Lexington’s Tates Creek Golf Course is located near the heart of the city’s south side, nestled up against several widely disparate neighborhoods. It is far and away the most “muni” of all of Lexington’s city courses. John Mark and I have probably played Tates Creek a combined 150 times between us, so I guess he was feeling nostalgic recently in wanting to return to our old shanking grounds. 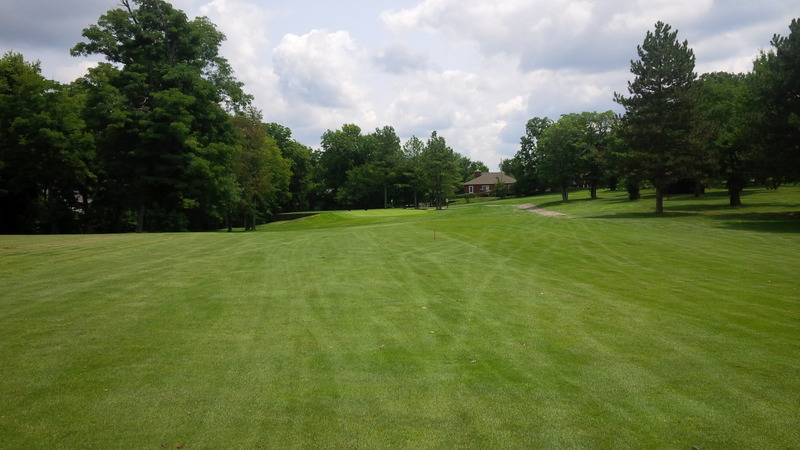 Like so many older municipal courses, Tates Creek was nestled well into the countryside when it opened in 1958 as the Tates Creek Country Club. However, time and urban sprawl quickly changed the character of the properties. In the case of Tates Creek, the adjacent properties developed into neighborhoods starting in the 1960’s, as the city grew towards the new Tates Creek High School, which was completed and opened for students in 1965. 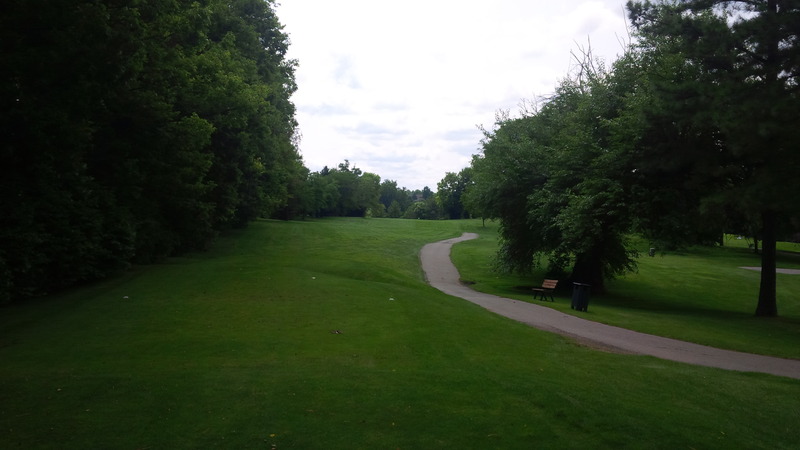 A solid tee shot in the fairway makes the green of the par 5 2nd hole at Tates Creek reachable. However, the sloping, tiered green isn’t receptive to low, penetrating long irons. 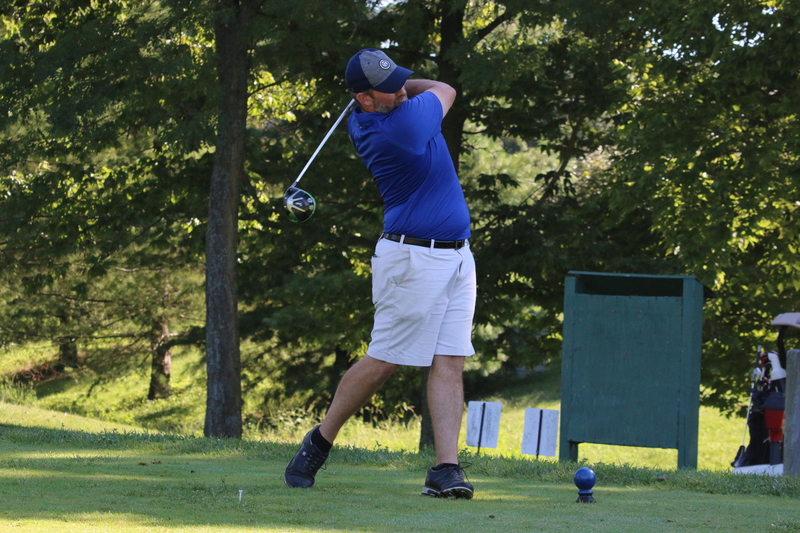 The course at Tates Creek was designed by Kentucky Golf Hall of Fame member Buck Blankenship., who is widely known in Kentucky for also designing Spring Valley Golf Club in Lexington, the Lindsay Golf Course at Fort Knox, and the Oldham County Country Club in La Grange. As a holdover from its country club origins, Tates Creek contains a large pro shop and concession stand, full-sized locker rooms, banquet facilities, and a large pool complex. My research couldn’t find much in the way of history of the Tates Creek Country Club, which was purchased by City of Lexington in 1971 for $ 1,075,645. The course has been operated as a municipal golf course since that time. 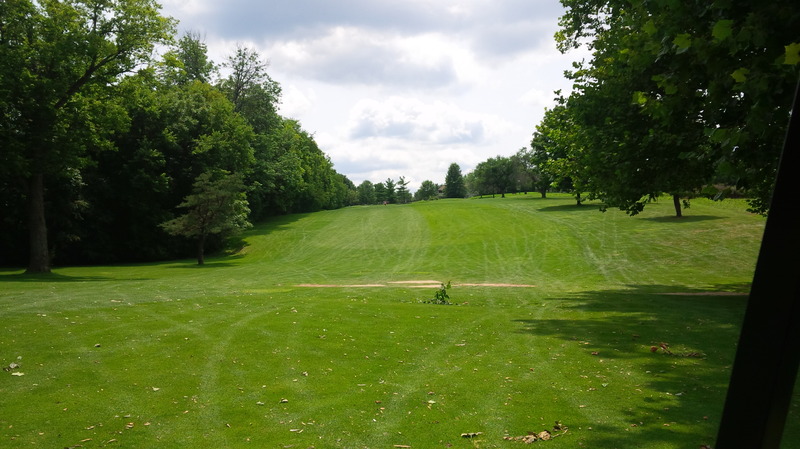 Tates Creek is a typical parkland style course set across gently rolling hills. 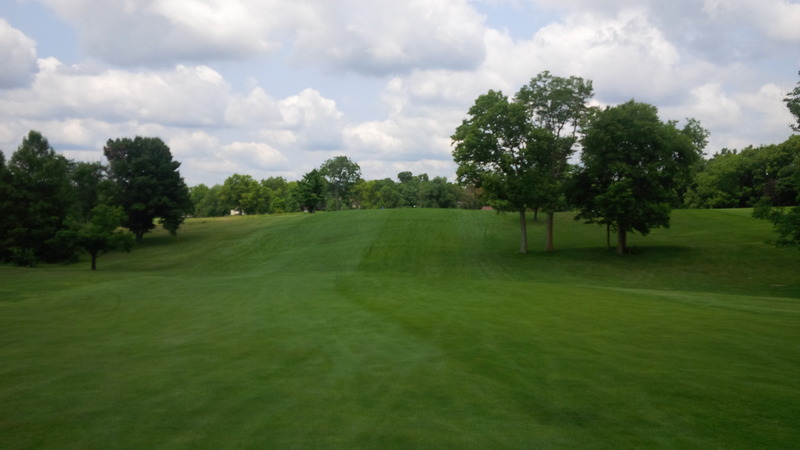 Most of the fairways are framed by rows of trees on either or both sides. Occasionally during a round at Tates Creek, a specimen hardwood juts out into a fairway or hangs in a manner that may affect an approach to the green. The par 5 3rd hole at Tates Creek is a straightforward hole that is fairly simple if you can avoid getting stuck behind the oak trees on your second shot. 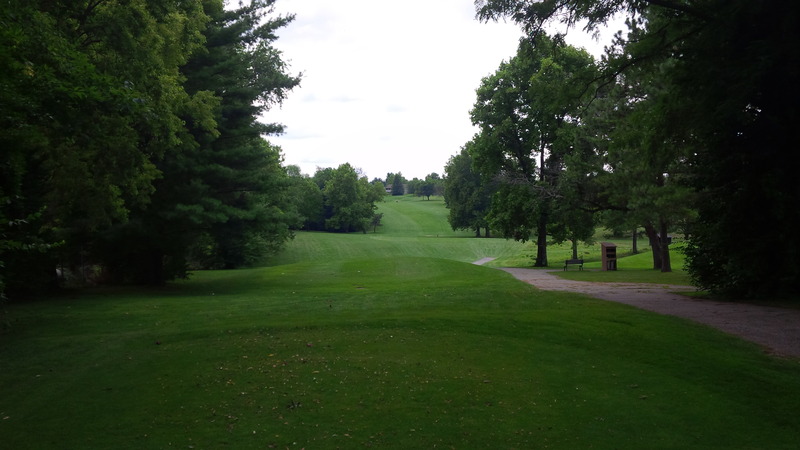 Tates Creek lost several large hardwood and pine trees in the 2014 winter ice storms, but not so many that it really had any effect on the way the course plays. According to the scorecard, Tates Creek is a short golf course. From the longest set of tees, the course plays to a course rating and slope of 69.4/126 at only 6,265 yards. 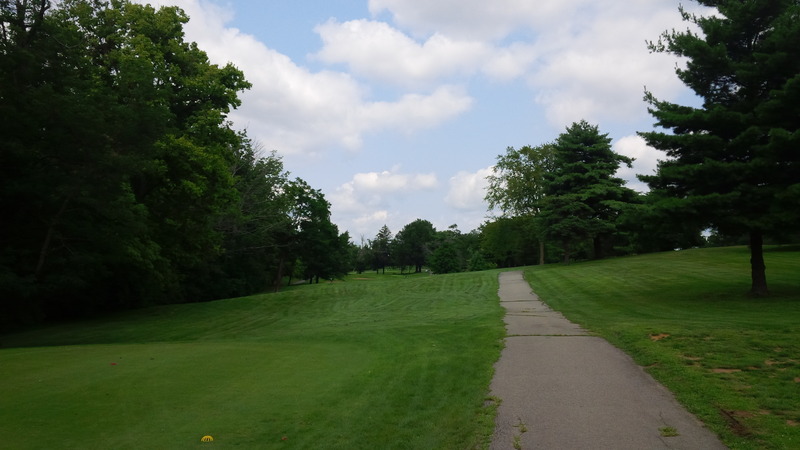 Like many municipal parkland courses in Kentucky, Tates Creek has been boxed in by urban sprawl, left without room to grow or expand to keep up with modern golf equipment. The greens at Tates Creek are small by modern standards, but certainly not postage stamp sized, like at the Gay Brewer Course at Picadome. The greens generally include a single long slope, which either slopes towards or away from the fairway, making putting fairly straightforward and the course susceptible to birdies and eagles. The long, uphill par 4 6th hole leading to a long, narrow green is probably the most consistently challenging hole on the course. The course contains only one pond that comes into play on three holes, to varying degrees. 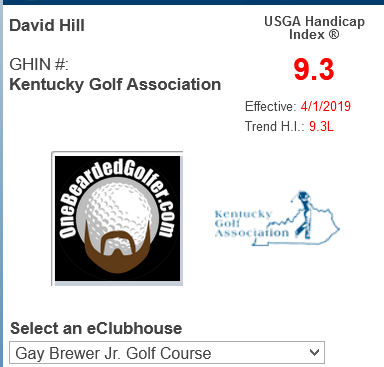 So, with so few bunkers and natural hazards and playing short from tee to green, if the wind isn’t howling across Tates Creek’s hills, the course can be left fairly defenseless to the golfer in control of his golf Ball. The fairways are a hodgepodge of bluegrass, fescue, rye, and Bermuda grasses, and on most holes, the rough is almost indistinguishable from the fairway, meaning there is little ball striking penalty for straying from the ideal landing zone. In fact, if one his hitting the ball well off the tee, Tates Creek can be a simple driver-wedge (bomb & gouge) golf course, over and over again. The tee shot from the 12th hole is one of no less than 8 tee shots that have the potential to leave the golf course in a hurry. 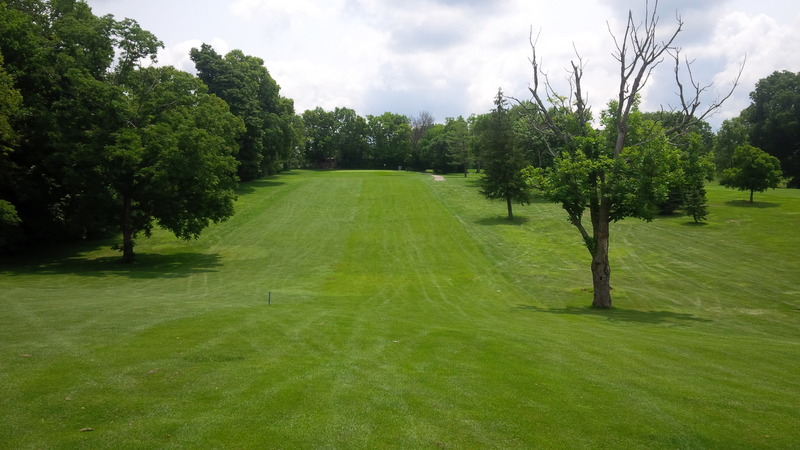 The course get a tremendous amount of play, which means that the tee boxes and greens are usually pretty worn. Given our unseasonable cool summer, the playing surfaces were actually in pretty good shape for late summer. Seriously, if you can’t grow grass under these conditions, you probably shouldn’t be a golf course superintendent. New carts were a really nice, unexpected surprise for John Mark and I, given that each successive budget cycle further threatens Lexington’s parks and recreation budget. 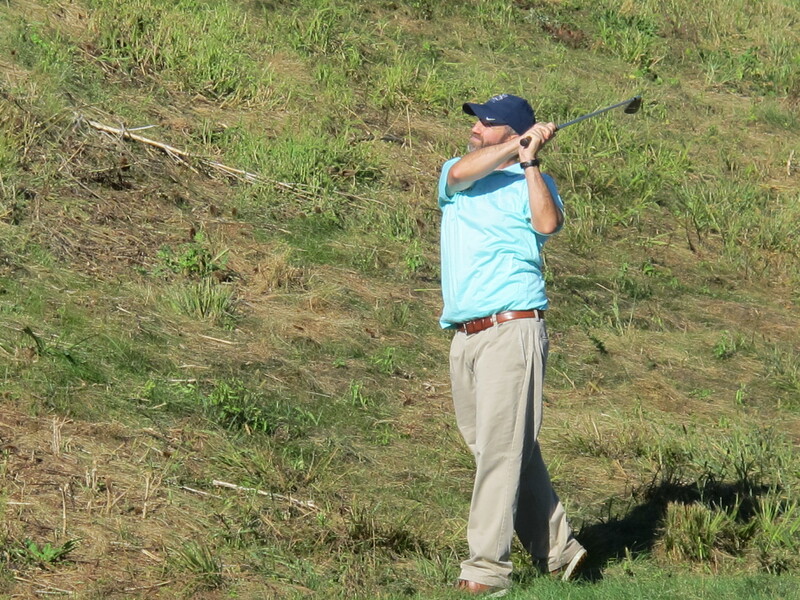 However, despite decent playing infrastructure, signs of a high “Bozo” factor were prevalent during our round at Tates Creek (i.e., un-repaired ball marks, unraked bunkers, lots of found Pinnacle golf balls). The collection of majestic, specimen hardwoods provide ready-made targets and no-fly zones at Tates Creek. The course has a couple decent practice greens and a small “practice range” that requires you to bring your own shag bag and not hit anything further than 150 yards. One of the interesting, if not annoying, features of note at Tates Creek is the layout to open and close a round. After soft opening hole, the course has two reachable par 5 holes that begin with elevated tees hitting down into a valley and back up to an elevated green. Par is an especially poor score on Number 3. 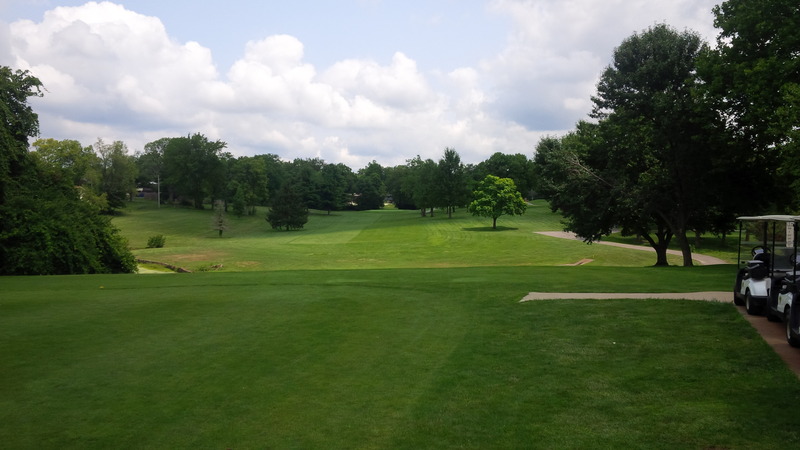 The three closing holes are as close to exciting as Tates Creek gets, with a short, green-light par 4, a mid-length, forced carry par 3, and strong three shot par 5 that plays into the predominant wind to finish. A hook of any strength will land you in jail, if not out-of-bounds, on the uphill par 5 13th hole. The severe dogleg right 18th hole is where many a double-or-nothing press bets have gone to die. This closing group of holes is as close to a signature stretch of holes as the course offers. If you can avoid the onslaught of seniors on a weekday morning, you should be able to get around Tates Creek’s 18 holes in three hours or less. During the peak of the Tiger Woods golf boom, Tates Creek was a haven for the marginal golf wannabe, leading to excruciatingly long rounds. However, there were few signs of that kind of riffraff on our early afternoon visit. Tates Creek is a just what a municipal golf course should probably be: a short, green collection of 18 holes that basically anyone can play. 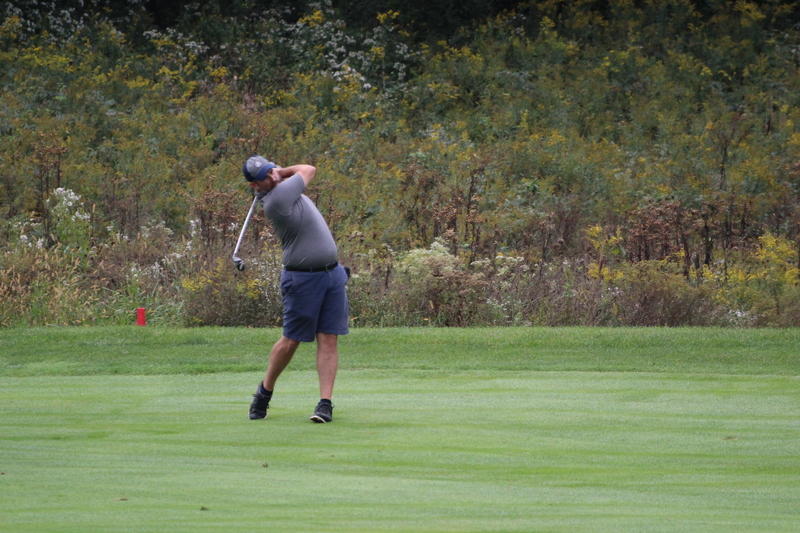 If you are struggling with your game and need to work out a few kinks, or want to try to overpower a course, post a low number, and feel better about your game, Tates Creek is the place to do it. At only 319 yards, the short par 4 16th hole is as close to a true risk/reward hole Tates Creek offers. Actually, I’m pretty sure that’s exactly what my playing companion accomplished during our round. It’s not fancy, it’s not difficult, but it’s golf, and that’s really all that matters I suppose. Are you sure it was Tates Creek CC and not Gainesway CC? I believe you’re right. It was originally organized as the Gainesway CC per the developers. 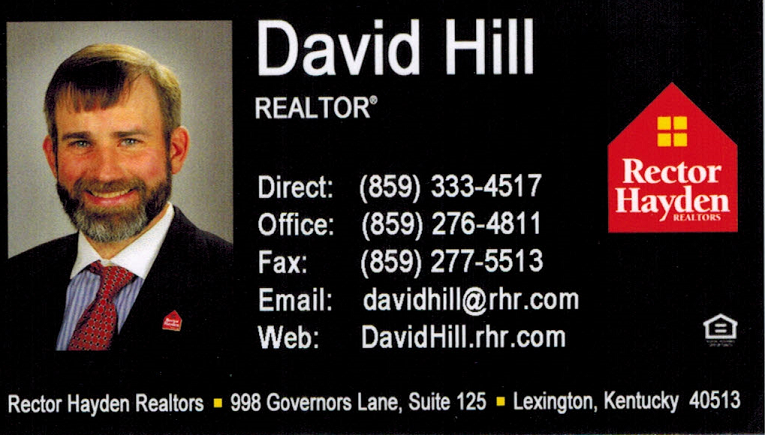 Not sure how long that iteration lasted.